As one of the Founding members of the Missouri Valley Impressionist Society (MVIS), I am pleased to announce that our very first exhibition as a group will be taking place this coming May at the Got Art Gallery located in Lee's Summit, MO. As we had planned, with great interest, a group exhibition specifically for Impressionists is finally near. This is a great opportunity, and one of the few made available, to view a collection of work done by the Impressionists of the valley in which we live. This exhibit is titled "Impressions," ﻿and will showcase 19 artists (38 pieces) representing the states of Colorado, Nebraska, Missouri, Kansas, and Iowa. The exhibit will run May 15th - June 18th. A reception will be held May 25th, 6-8 pm during downtown Lee's Summit Fourth Friday events. 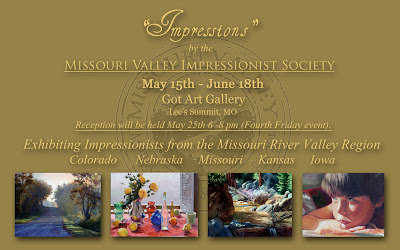 The Missouri Valley Impressionist Society is an organization that unifies Representational Impressionism throughout the Missouri River Valley Region, from the Western gateway of St. Louis to the Rocky Mountain States of Montana, Wyoming, and Colorado.